YOU GUYS! 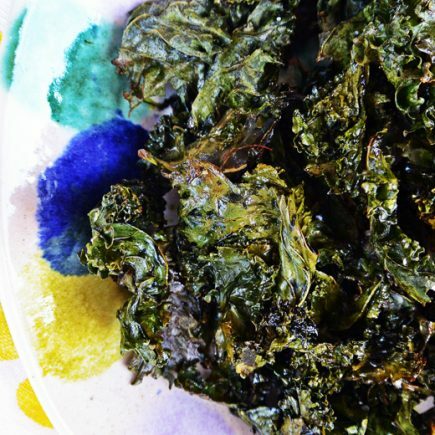 I am so excited to finally be sharing this recipe with you today. Because cheeeeeeese!!! 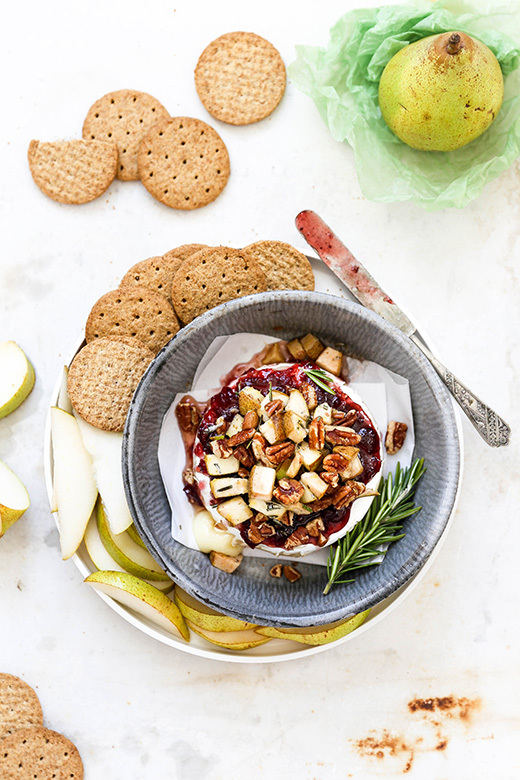 This Cranberry-Pear Baked Brie with Pecans is to die for. You NEED to make it for Thanksgiving. And then again for Christmas. And then probably a third time for New Year’s Eve. Seriously. It’s that good. What makes it so good, you ask? Well, let me tell you. I’m so smitten with this recipe. And I know you will be, too! I’ve partnered with Harry & David to be able to bring you this recipe today, which features some of my favorite seasonal Harry & David products. Harry & David is one of my go-to destinations for gourmet foods, entertaining ideas and festive Holiday gifts. Shopping with Harry & David is easy (and fun!) and it will certainly help to alleviate some of your Holiday stresses. I highly recommend it. I’ve been known to stock up on their Moose Munch like nobody’s business. It’s a serious addiction! Today’s recipe showcases their Country Cranberry Relish, which is a new-to-me product but one that’s quickly gained a permanent spot on my condiment shelf (I’ve been spreading it in my turkey sandwiches and HOLY YUM!). And their famous Royal Riviera Pears. If you’re a person who thinks they don’t like pears, I get it. The ones from the grocery stores are usually never ripe, devoid of flavor and have a grainy texture. But Harry & David’s Royal Riviera Pears are WAY different. They are sweet, juicy and buttery smooth. Perfect for eating out of hand. Or using in recipes. I guarantee they will convert you to a bona fide pear lover! 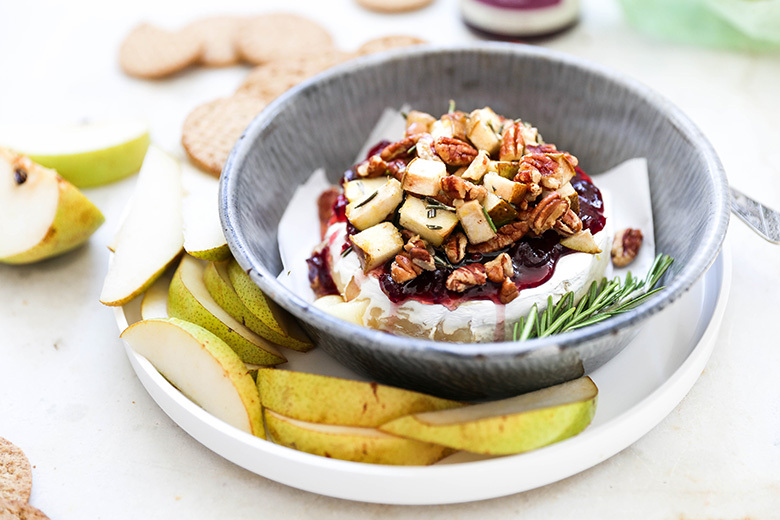 Preparing this Cranberry-Pear Baked Brie with Pecans is as easy as pie. 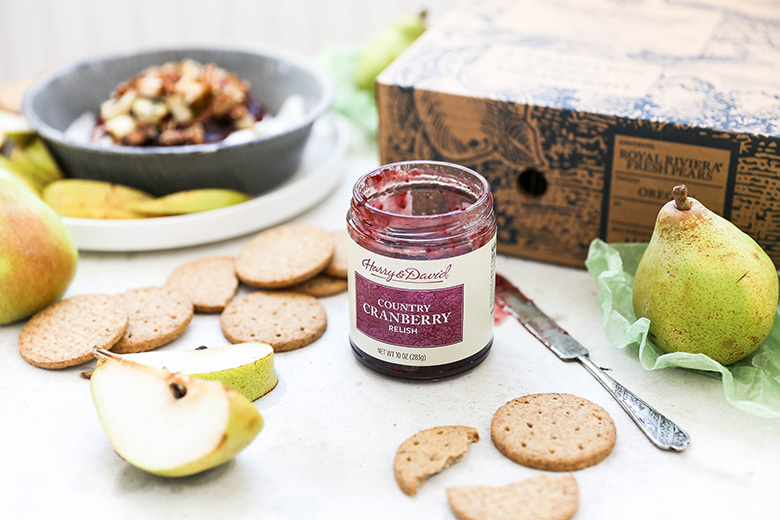 It goes a little something like this: (1) spread a layer of Harry & David’s Country Cranberry Relish on top of a wheel of brie cheese, (2) pile on a mixture of chopped Harry & David’s Royal Riviera Pears (you don’t even have to peel them! ), pecans, brown sugar, butter, rosemary and lemon zest, (3) bake and (4) devour. 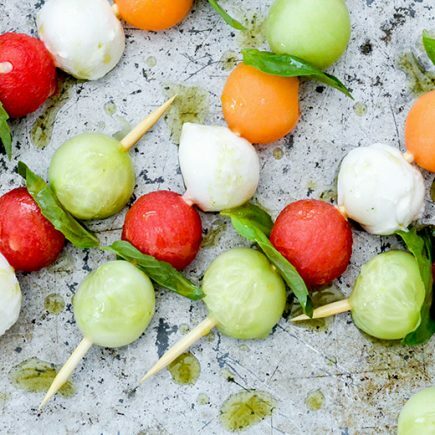 Less than 20 minutes stands between you and appetizer nirvana. We all know that warm brie cheese upstages cold brie cheese any day of the week. And when combined with this fruity, nutty, citrusy and herby topping, you’ve got a real winner on your hands. This baked brie will have you and all your friends and family coming back for bite after bite after bite. 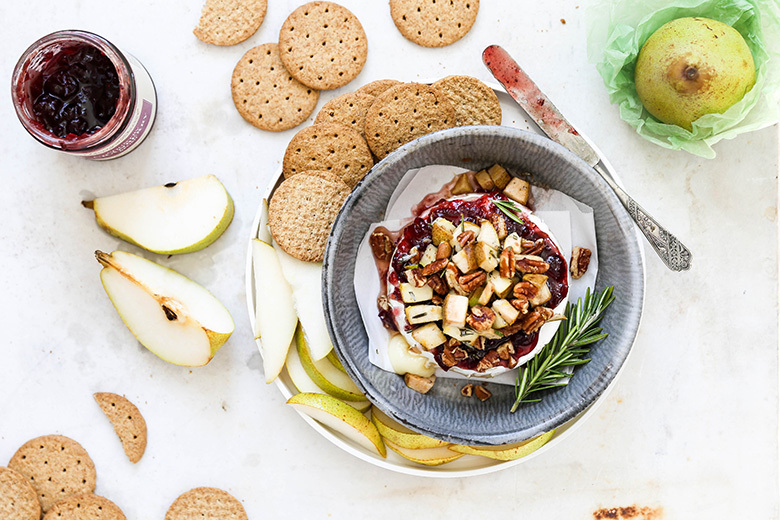 Let’s talk party logistics as it relates to this Cranberry-Pear Baked Brie with Pecans. If you’re having a decent size gathering, you’ll most likely want/need more than a single 8-ounce wheel of brie cheese. Because more cheese = more fun. Right?!?! So to handle a hungry crowd (and still maintain optimal levels of cheesy melty-ness! ), I’ll prepare two wheels of brie cheese as written through step 2 in the recipe below. But then I’ll only bake off and serve one of those two wheels at a time. My guests stay well fed and happy. And I’m not stressed out because I know all I need to do is just pop the second wheel into the oven as soon as I notice the first one has started to get picked over. Hostess WIN! 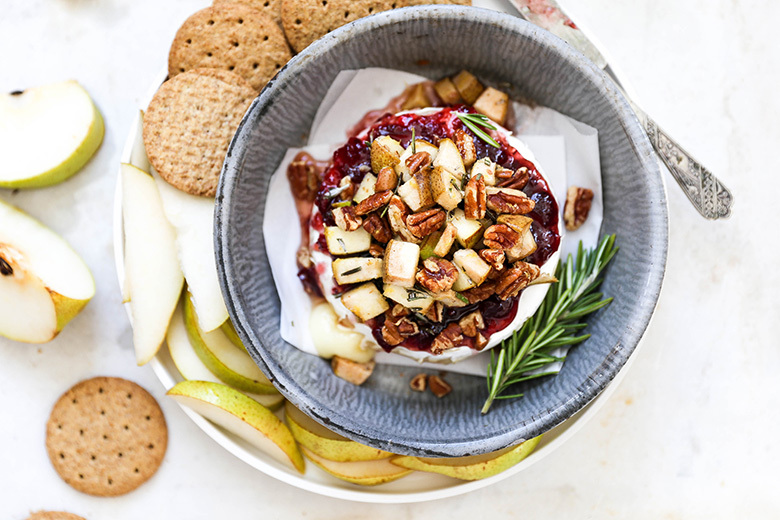 If you try my Cranberry-Pear Baked Brie with Pecans this Holiday season, let me know! I’d love to hear from you! Pre-heat your oven to 350 degrees. Line two small baking dishes with parchment paper. Place one wheel of brie cheese in the center of each dish (on top of the parchment paper). Spread about 1/4 cup of the cranberry relish on top of each wheel. Set aside. In a medium bowl, combine the chopped pears, pecans, brown sugar, melted butter, rosemary and lemon zest. Then spoon this mixture over the cranberry relish layer. Transfer to your pre-heated oven and bake for 12-14 minutes. The brie should be warm and the topping slightly browned. If you’re hosting a party, consider baking off one wheel at the start of the party, and the second wheel later in the evening! Serve warm with pear wedges, sliced bread and crackers of your choice. OMG this looks AMAZING! I’m 100% making this for Friendsgiving this weekend! Yes, girl! 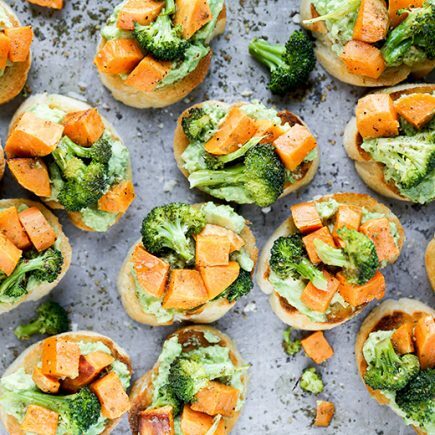 Perfect for a Friendsgiving! Ummm, yum! Liz, I’d totally just make this a meal… Is that weird? I think I could live off bread and cheese. Oh this WAS my lunch the day I made it. Bread and cheese for life! I LOVE Harry & David Liz! So many delicious things to choose from! And this brie!! Hello! One of my favorite things about the holidays. I make a special baked brie every holiday season and it’s one of those appys that always disappears quickly. I will most definitely be giving your recipe a try. It looks wonderful! It’s hard to resist warm brie cheese! I hope you love this version! So good with the pears and cranberry relish! OMGeeee, yes please! That country cranberry relish makes my eyes happy, but on top of a wheel of brie? Even better! Gorgeously and so deliciously presented Liz! !